I was about to delete a press release about a guy buying a winery in Calistoga to make cool-climate wines when I put on my imaginary beret and tried to think of it as a Frenchman would -- it's bizarre. In Europe, the prevailing belief is that a winery is a part of terroir. If you want to call a wine Rioja, you have to actually make it in Rioja. You can't buy the grapes and truck them to Ribera del Duero. If you do, you have to call it a Vino de Mesa -- table wine. Obviously we don't follow this thinking in the U.S. A winemaker like Adam Lee can buy grapes in Oregon, truck them to California to process at his winery, and still use the Willamette Valley appellation. Americans don't think the winery location matters. Europeans disagree for essentially two reasons. First, it's possible that yeast in the grape growing region will be different than yeast in the winery region, and they consider yeast a part of terroir. Yeast is at the heart of the "natural wine" movement, and different yeasts definitely impart different flavors. Second, it's a full-employment philosophy. Big wine conglomerates in Europe have to build wineries in every region in which they operate, and that creates more jobs. In contrast, the first thing a company like Diageo does when they buy a winery like Rosenblum is consolidate facilities and lay people off. Though I feel badly for workers who lose their jobs, I side more with the American way of thinking on this. Why shouldn't Schramsberg buy Marin County grapes for its sparkling wine? Nonetheless, while I'm happy for Mark and Teresa Aubert, who just purchased the former August Briggs winery on Silverado Trail in Calistoga, it strikes me as, well, bizarre. 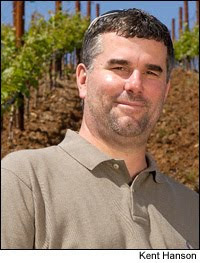 Mark Aubert is best known for his intense, full-bodied Chardonnays from cool regions. He'll still be buying the grapes from chilly Sonoma Coast and Carneros vineyards, but he'll be trucking them into the hottest part of Napa Valley. I don't want to imply that heat is a practical problem beyond timing: he will have to make sure he gets the grapes early in the morning. Once the grapes get to the winery, that's what air-conditioning is for. But what I do think is weird is that Napa Valley Chardonnay has a taste profile that is (in)famous: Fat, gooey, low in acid. Less-sophisticated wine drinkers enjoy it, whereas Aubert's normal audience are collectors and aficionados. I don't think yeast plays the main role in the Napa Chardonnay taste: it's winemaker decision, playing to the marketplace. But still: if I'm in the hottest part of Napa Valley, and I see a Chardonnay-focused winery, I expect the wines to have that Napa Valley flavor. And these, hopefully, will not. Aubert's wines will still have the grapes' region of origin on the bottle; Sonoma Coast will be prominent on the front label if the grapes are from there, whereas "bottled in Calistoga" will be tiny on the back. There shouldn't be any consumer confusion. Still, it does make you wonder what exactly "terroir" is, and why -- in an ongoing tough time for northern California wineries -- there weren't any cheaper winery facilities in a cooler-climate area. Interestingly enough, we have one vineyard from Oregon (Muirfield) that seems to have a very difficult time with native yeasts -- as it always seems to produce unacceptably high levels of ethyl acetate in the wine. This is true virtually every vintage -- and not true of a neighboring Oregon vineyard -- so not sure that all yeasts native to a vineyard are compromised by trucking the grapes to a different area. Adam, that is interesting, and part of a counter-argument against native yeast fermentation, which I just got a mouthful of at Natural Wine Week. How many of your wines do you inoculate? The number of wines we innoculate varies fairly significantly from vintage to vintage. In 2008, for instance, where we had more botrytis issues, we innoculated more frequently. In 2007 and 2009, where the fruit was generally cleaner, we innoculated less. Really is a vintage by vintage, vineyard section by vineyard section decision. Josh: Yeah, that thought occurred to me, though not as soon as it occurred to Mark Aubert ... I'm sure that was an attraction, but it still feels like coming upon, say, a Rhone tasting room in Bordeaux. Doesn't Mark Aubert make a Bordeaux blend from a vineyard in the Napa Valley? Love the descriptors "fat, gooey" - too funny, and very evocative of the style you're trying to avoid. Seriously, if that's his intention in putting the winery there, than my post is off base -- unless you're French, in which case the whole US system is weird anyway.